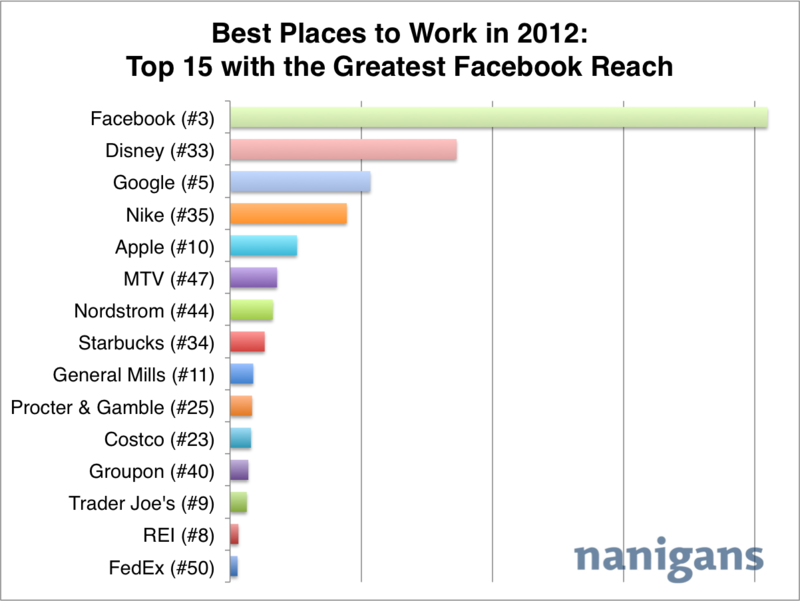 50 Best Places to Work in 2012: Which Wins in Popularity on Facebook? All of the top 15 companies with the greatest Facebook reach are consumer facing, with business facing companies like Bain & Company and McKinsey & Company (ranked #1 and #2 best places to work by employees, respectively) not making the list. 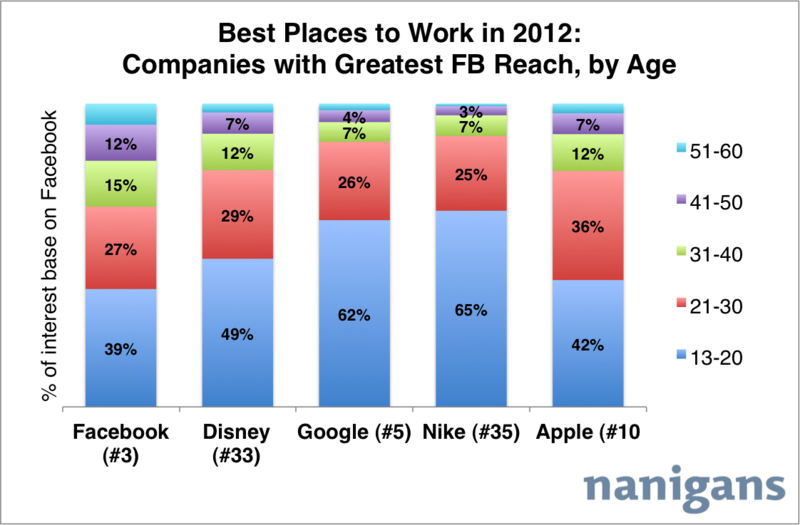 To no surprise, Facebook, the 3rd best place to work in 2012, comes out on top with well over twice the reach of Disney — the company with the 2nd greatest reach on Facebook. Google, Nike and Apple — all popular consumer product companies — round out the top five. Nike is the only company with a larger fraction of male interest on Facebook than female interest. 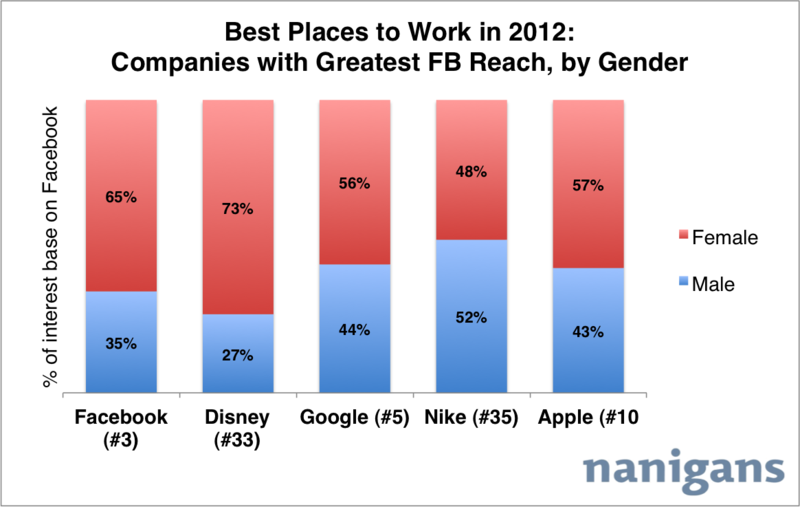 Disney, followed by Facebook itself, has the largest fraction of interest from females on Facebook. When breaking down interest in these companies on Facebook by age, Nike and Google resonate most with younger Facebook users. Nearly 90% of these companies’ interest bases are under the age of 30. On the opposite end of the spectrum, Facebook has the largest fraction of older users interested in the company on Facebook, with over a third of the company’s interest base over the age of 30. Congrats to all of these companies for their Employee Choice Awards!